With such a great variety in gorges, it is almost impossible not to choose one in this prefecture as well. Koutraliotis Gorge is a joy ending in the unique Preveli Lake-beach. Visit the Monastery on your way to the homonynus beach. Hiking in Psiloritis, locate the traditional shacks (mitata) and gather clues about the bucolic tradition of the island. Meet Anogia...with the sound of the Cretan lyre echoing on the slopes of Psiloritis. Swimming in the beach of Agios Pavlos. You should definitely stay the night, simply because the stars in South Crete are brighter! Wandering around the city of Rethymno, a picturesque port, Cretan cuisine, tsikoudia and unforgettable moments. Do not miss the Fortezza fortress! Visit the Monastery of Arkadi protected by Unesco as a European monument of freedom. The valley of Amari, Cretan lush sweet-scented nature, where Patsos Gorge starts from. Dining at Argyroupoli accompanied by the sound of waterfalls. The beautiful Triopetra Beach, an alternative for those seeking a less crowded beach. 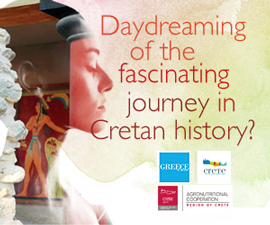 Visit the cave Melidoni, a monument of nature and history. As an alternative to the combination Kourtaliotis Gorge - Preveli Lake, you can choose the Monastery of Preveli - Preveli Lake. In both cases, you will end up in the same wonderful beach.